general term used for those diseases with permanent or temporary narrowing of small bronchi, in which forced expiratory flow is slowed, especially when no etiologic or other more specific term can be applied. A chronic, progressive lung disease in which there is poor airflow in the lungs, characterized by wheezing, shortness of breath with difficulty exhaling, and cough. a progressive and irreversible condition characterized by diminished inspiratory and expiratory capacity of the lungs. The condition is aggravated by cigarette smoking and air pollution. COPDs include asthma, chronic bronchiectasis, chronic bronchitis, and emphysema. Also called chronic obstructive lung disease. A condition affecting mainly elderly people who have partial obstruction to the flow of oxygen from the atmosphere to the blood in the lungs that cannot be completely relieved by treatment. 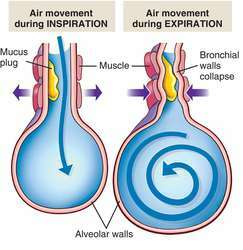 COPD may be caused by one of at least three conditions—breakdown of the walls of the tiny lung air sacs (alveoli) leading to EMPHYSEMA, excessive mucus and pus production in the air tubes as in chronic BRONCHITIS, and long-term ASTHMA. The disease has recently been shown to be related to the state of histone deacetylation that determines chromatin unwinding. Oxidants from cigarette smoke or inflammatory cells deactivate deacetylase enzymes in lung macrophages allowing RNA polymerase II and nuclear factor-KB to bind to DNA and promote transcription of interleukin-8, tumour necrosis factor alpha, and proteinases that destroy the extracellular matrix. A term used to describe chronic lung diseases, like chronic bronchitis, emphysema, and asthma. General term for the diseases with permanent or temporary narrowing of small bronchi, in which forced expiratory flow is slowed, especially when no etiologic or other more specific term can be applied. Most of the chronic obstructive pulmonary disease patients start smoking at a younger age (in teenage). The study's authors said the mechanisms linking soda consumption with asthma and chronic obstructive pulmonary disease are unclear, but both disorders are associated with inflammation. Diet and 20-year chronic obstructive pulmonary disease mortality in middle-aged men from three European countries. Does vitamin E supplementation help in COPD? The term "hut lung" has been used to describe a wide spectrum of clinical manifestations including chronic bronchitis (CB), chronic obstructive pulmonary disease (COPD), and interstitial lung disease associated with high level exposures to biomass smoke. Adam Singer examines Ted Flynn, 78, of Toluca Lake, who's had chronic obstructive pulmonary disease for more than 10 years. Chronic obstructive pulmonary disease covers emphysema, chronic bronchitis with airflow limitation and poorly reversible asthma. Additional studies should be conducted to confirm that HMPV exacerbates chronic obstructive pulmonary disease. First, the suffering and physical limitations associated with conditions such as asthma and chronic obstructive pulmonary disease may create a sense of hopelessness and despair. SAN DIEGO -- Levalbuterol was no more effective than albuterol in chronic obstructive pulmonary disease, according to findings from a single-dose comparison trial. SAN ANTONIO -- Patients with chronic obstructive pulmonary disease have an increased risk of severe vertebral fractures, which often go unrecognized by their physicians, based on a study with 296 patients. Its 98% efficiency in delivering the required drug dosage maximizes therapeutic effects for all conditions, including asthma, chronic obstructive pulmonary disease (COPD), emphysema, and chronic bronchitis.